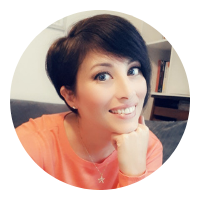 If you'd like a unique interview or guest post please get in touch, and I'll be happy to create one for you. 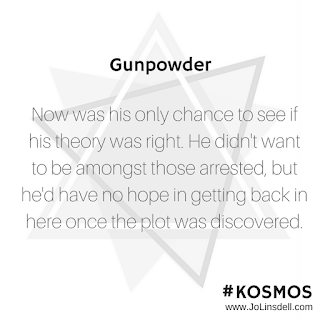 Gunpowder is the 2nd episode in the KOSMOS series. 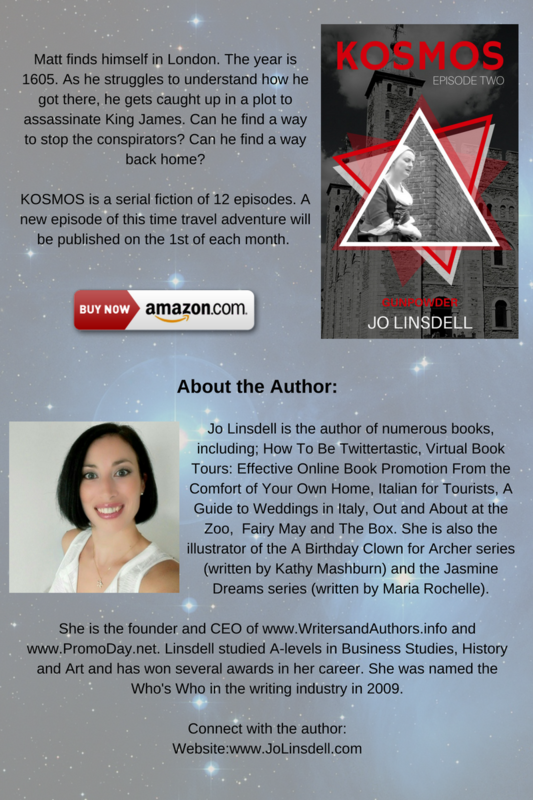 Jo Linsdell is the author of numerous books, including; The Pendant, How To Be Twittertastic, Virtual Book Tours: Effective Online Book Promotion From the Comfort of Your Own Home, Italian for Tourists, A Guide to Weddings in Italy, Out and About at the Zoo, Fairy May and The Box. She is also the illustrator of the A Birthday Clown for Archer series (written by Kathy Mashburn) and the Jasmine Dreams series (written by Maria Rochelle). 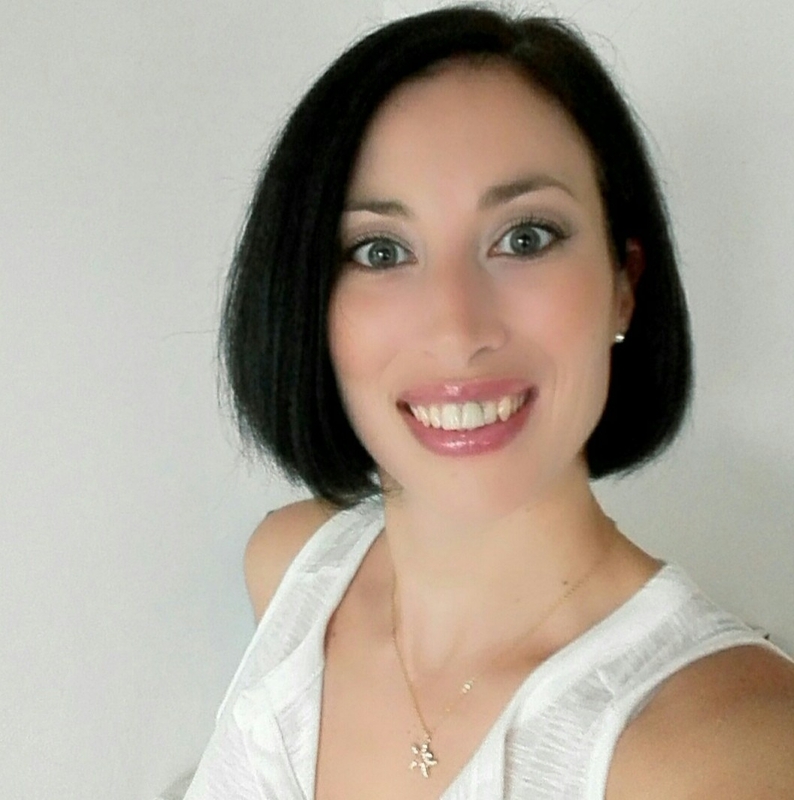 Copy the code to embed the giveaway on your blog. 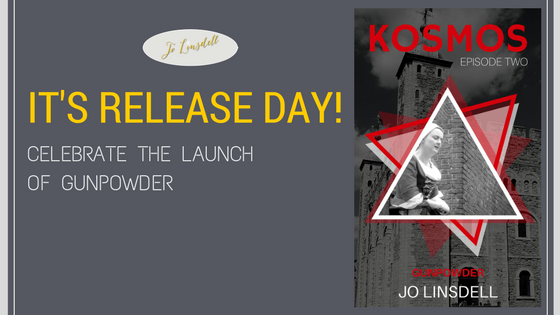 Prize: A copy of The Pendant, Gunpowder and an ARC of Gladiator. KOSMOS is a serial fiction of 12 episodes. A new episode of this time travel adventure will be published on the 1st of each month. 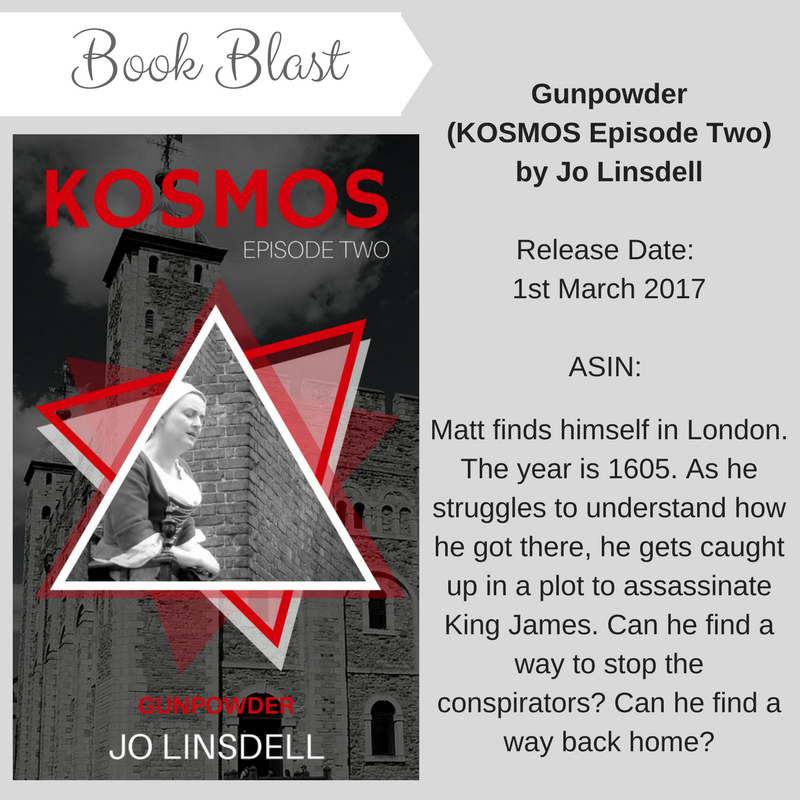 My latest release is Gunpowder which is episode two in the series. 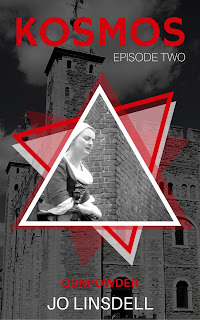 In this book the main character, Matt, finds himself in London. The year is 1605. As he struggles to understand how he got there, he gets caught up in a plot to assassinate King James. 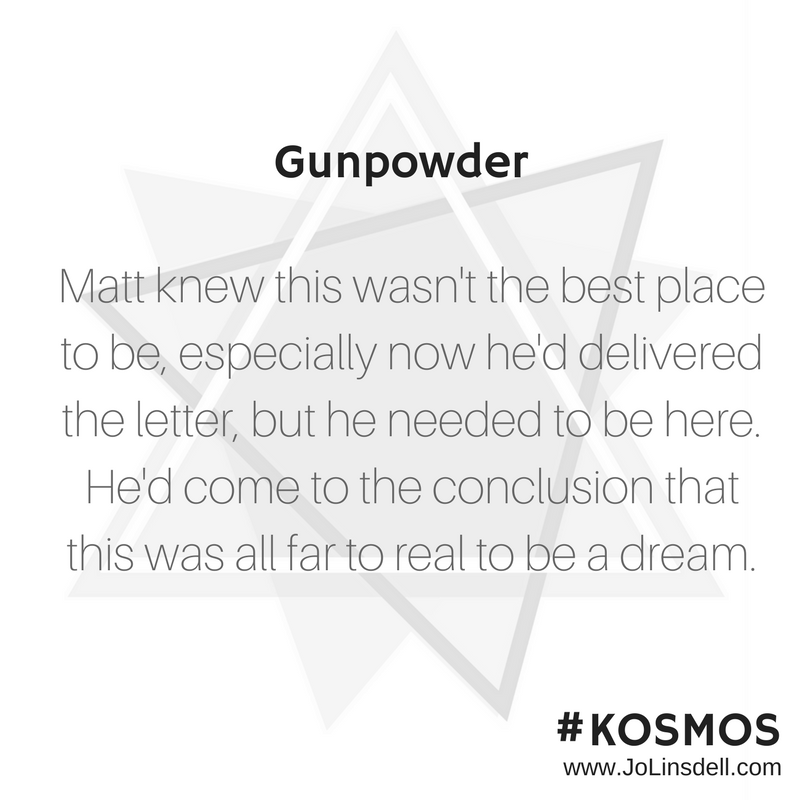 KOSMOS is a time travel, pre-teen, serial fiction. I start with a rough outline and vague idea of the characters. I'm definitely a planster. I don't like to over think it or outline in too much detail, but at the same time I like to have an idea of what I'm going to write. I find inspiration everywhere. My kids are my biggest inspiration though. 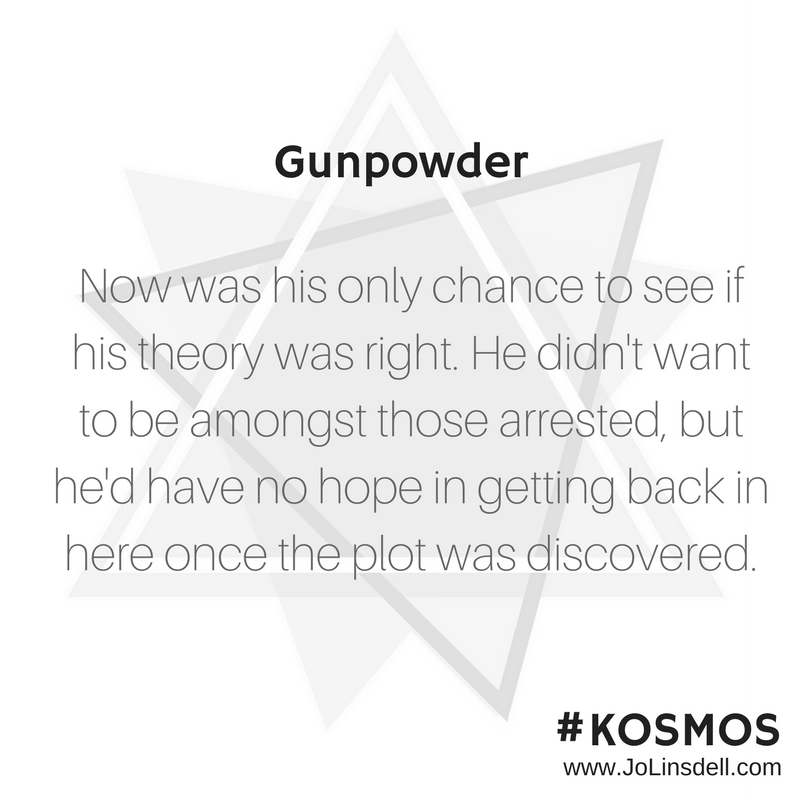 My nine year old got involved in the process whilst I was writing the KOSMOS series. He was always asking what was going to happen, and where Matt (the main character) was going to go next. It made researching a lot of fun as he would join in with me. I think all writers do at some point. I'm a big fan of writing challenges like NaNoWriMo and A Story A Week. Hitting my daily word count isn't always easy. There have been days when the words just didn't want to come. In some cases those days actually turned out to be some of my most productive writing days. The trick is to keep writing anyway. The first draft doesn't have to be perfect, it just has to be written. The editing stage will sort out any problems. You just need to get the story out and onto paper. The only way to do that is to keep writing. 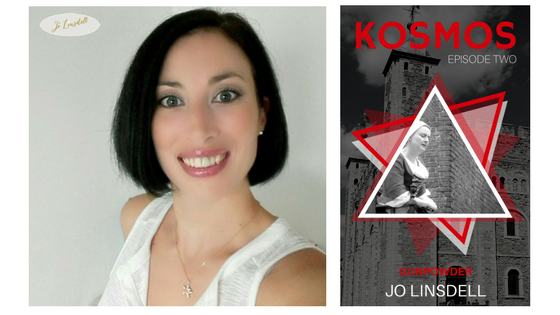 What's the best thing about being a published author? I get to send my thoughts and feelings out into the world. Even if just one person connects with what I wrote and likes it it's the best feeling ever. Every book a person reads leaves a little something behind when it's over. It's nice to know that I can touch someone else's life like that. Even more so if the reader is a child. I think most writers think about this at some point. I often pin photos on Pinterest of my dream cast. I think Dylan O'Brien (Teen Wolf actor) would be good as Matt (https://it.pinterest.com/pin/470274386075443460/). 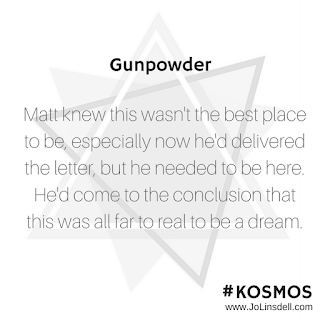 Matt lifted the lid from one of the barrels and looked inside to find it full of black powder. It appeared to be charcoal, but with a strange smell to it. Matt sniffed the air. It had an sharp, sour aroma to it that made him gag a little. Wow, this dream sure is realistic, he thought as he swallowed down the bile in his throat. Footsteps sounded from outside. They were coming this way. Matt jumped behind the barrels to block himself from view. Wow I'm a coward in my dreams too, he thought, as he tried to make himself as small as possible. "I'll bring in more barrels later on tonight. It's safer to do it with the cover of the night", said a short man. He was wearing some kind of strange tights, with puffy looking shorts over the top. Matt's gaze worked its way up. A large cape hung around his shoulders, and a large collar fanned out around his neck. On top of his long dark hair sat a brimmed hat with a fancy looking feather sticking out of it. He had a long moustache and beard. I must be in some kind of theatre, thought Matt. He used to love going to the theatre. His dad would take them every year around Christmas time. It had been one of their family traditions. "We should have enough gunpowder to do the job now. Twenty barrels, plus the sixteen we brought in over during July", said the other man. This one was tall, with a more powerful build. He had thick reddish brown hair, a flowing moustache, and a bushy reddish brown beard. "Just make sure you bring some firewood and coal to conceal it." "Will do John" said the short man. "I'll be back myself tomorrow to check on everything. We can't have the gunpowder decaying like it did before. We need to stand station. The moment is almost upon us, and we must be ready". There was no doubt that the taller of the two men was the one in charge. "Wintour will drop by to check on things over the next few days too", he added. He took a step closer to the barrels and Matt froze. "Right you are" said the short man. Then the two of them, satisfied with the conditions of the room, left shutting the door behind them. Matt let out the breath he'd be holding. Gunpowder? He was sat behind barrels of gunpowder? Great hiding place idiot he told himself. It's a good job this is all a dream or this would all be highly dangerous.